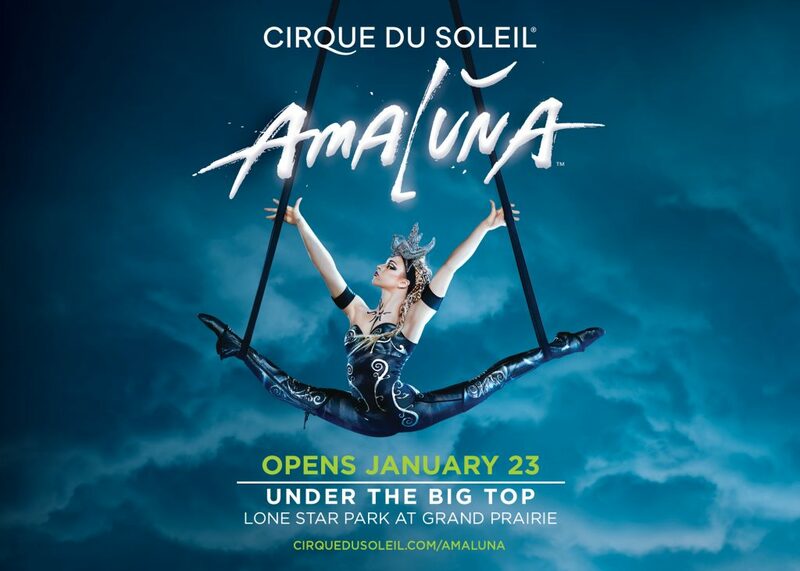 Lone Star Park at Grand Prairie presents Amaluna! The perfect show for you and your Valentine. Begin the adventure on the mysterious island ruled by goddesses. After directing her daughter’s coming of age ceremony, honoring femininity, renewal, rebirth, and balance, Queen Prospera causes a storm. A group of young men washes up on the isle, triggering an epic love story between Prospera’s daughter and a brave young suitor. Theirs is a love that will be tested, and a performance not to be missed! Tickets are valid for a select showing on Thursday, February 14th at 8:00 pm at Lone Star Park at Grand Prairie. Would you like to receive emails from DFWChild and our partners? NO PURCHASE NECESSARY TO ENTER OR WIN. VOID WHERE PROHIBITED BY LAW. By entering the contest, you agree to abide by these Official Rules and the decisions of Lauren Publications, Inc. and the judges, which shall be final and binding on all matters pertaining to this Contest. Not an employee (nor their immediate families and members of the same household) of Lauren Publications, Inc., its affiliates, subsidiaries, agents, judges, participating vendors, advertising or promotion agencies, or anyone working directly or indirectly on this program, product and promotion. The Contest begins at 12:01 AM Pacific Time (“PT”) on Wednesday, January 23, 2019 and ends at 11:59 PM PT on Tuesday, February 12, 2019 (“Entry Period”)—Any entries received after the Entry Period will not be eligible for judging. Promotes alcohol, illegal drugs, tobacco, firearms/weapons (or the use of any of the foregoing) or a particular political agenda. Defames, misrepresents, or contains disparaging remarks about other people or companies. Contains materials embodying the names, likenesses, voices, or other indicia identifying any person, (other than the member of your family or community for which you have received consent) including, without limitation, celebrities and/or other public or private figures, living or dead. We reserve the right to modify or reject any entry, in our sole and absolute discretion, that we determine does not meet the above criteria. To enter, you must register at www.dfwchild.com/contests. You may only enter one time per registered user at dfwchild.com. If you enter more than once under the same registered username each new photo and essay will overwrite the existing entry. Lost, late, incomplete, inaccurate, stolen, misdirected, undelivered and/or garbled entries will be disqualified. In the event of any dispute regarding whether you submitted a particular entry, you must provide us with proof that you are the authorized account holder of the e-mail address associated with the entry in question. Please note that following the end of this Contest your entry may be posted on publicly accessible Web sites or in print. The Promotion Parties are not responsible for any unauthorized use of your entry by visitors to this Web site. While we reserve these rights, we are not obligated to use your entry for any purpose, even if it has been selected as a winning entry. If you do (or, if you are a minor, your parent or legal guardian does) not want to grant us these rights to your entry, please do not enter this Contest. If you are a winner and you (i) do not reply to such notification or the notification is undeliverable, (ii) are not otherwise in compliance with these Official Rules, you will be disqualified and, we may, at our discretion, notify a runner-up or, if a random drawing prize, randomly select an alternate winner from among all remaining eligible entries received for that monthly drawing. If you are a winner and accept the prize, you agree that we and our staff shall have the right to use your name, city and state of residence in any and all media now or hereafter known worldwide in perpetuity, without additional compensation, notification or permission, unless prohibited by law. Winner may be required to sign an affidavit of eligibility and liability release and, where permitted, publicity release. You understand that all prize details shall be determined by us. The Promotion Parties are not responsible for any liability, cost or injury incurred by Participants arising out of or in connection with the Contest, including, without limitation, the following. Lost, late, incomplete, inaccurate, stolen, fraudulent, misdirected, undelivered, interrupted, damaged, delayed, or postage-due reports, entries, mail, or delays in operations or transmission of information, in each case whether arising by way of technical or other failures or malfunctions of computer hardware, software, communications devices, or transmission lines or data corruption, theft, destruction, unauthorized access to or alteration of entry materials, loss or otherwise. Equipment, software, networks, or systems that fail, have viruses or other problems, are breached, or that cause injury or damage to participants or their property. By entering this Contest, you agree to, and hereby release and hold harmless Lauren Publication, Inc., its affiliates, subsidiaries, and advertising or promotion agencies, and anyone working directly or indirectly on this program, product and promotion, and all of their respective officers, directors, employees and representatives (which for the purpose of these Official Rules will be referred to together as the “Promotion Parties”) from any and all liability or any injuries, loss or damage of any kind arising from or in connection with this Contest or acceptance and use of any prize. This Contest is void where prohibited or restricted by law and subject to all applicable country, federal, state and local laws and regulations. This Contest is governed by Texas law. You agree that the jurisdiction and venue for the handling of any disputes or actions arising out of this Contest shall be in the courts of the State of Texas. If, for any reason, the Contest is not capable of running as planned for any reason, including, without limitation, the reasons set forth above, we reserve the right at our sole discretion to cancel, terminate, modify or suspend the Contest. If a solution cannot be found to restore the integrity of the Contest, we may, at our sole discretion, determine the winners of this Contest using all non-suspect, eligible customer redemption reports and/or entries received (as applicable) before we had to cancel, terminate, modify or suspend the Contest. We may disqualify you from participating in the Contest or winning a prize (and void your participation in the other promotions we may offer) if, in our sole discretion, we determine you are attempting to undermine the legitimate operation of the Contest by cheating, deception or other unfair playing practices, or intending to annoy, abuse, threaten or harass us, any other entrant or our representatives or if you are otherwise not in compliance with the terms of these Official Rules. CAUTION: ANY ATTEMPT BY YOU OR ANY OTHER INDIVIDUAL TO DELIBERATELY DAMAGE ANY WEB SITE OR UNDERMINE THE LEGITIMATE OPERATION OF THE CONTEST IS A VIOLATION OF CRIMINAL AND CIVIL LAWS AND SHOULD SUCH AN ATTEMPT BE MADE, WE RESERVE THE RIGHT TO SEEK DAMAGES FROM YOU TO THE FULLEST EXTENT PERMITTED BY LAW.